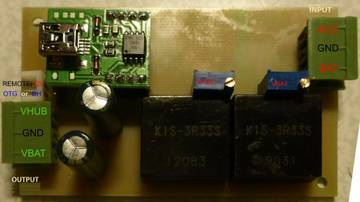 -constant voltage 4.5V in output power supply for the tablet (to contacts instead of the controller or the batteries), but turns off when the ACC was no more than 17 hours. -when power is "off" on ACC, after 5 sec voltage on OTG is lost(in this case GND is "on" for Hall Sensor) (swallowing moving starter), Voltage on Hub waiting more 20 min(*), if during this 5 sec АСС "coming back", that trip does not occur. -after the voltage has an OTG, after 1sec going on +12v REMOTE(for switching on amplifier, it exclude loud "NOISE" in speakers), and going off, if ACC is "off". 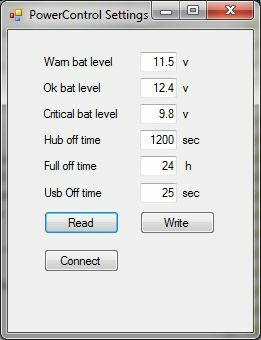 -when voltage goes down till 11.5v and more, after 60 sec power is "off" on OTG (in this case GND is on for Hall Sensor), after more 10 sec power is "off" on HUB, and more 5 min FULL power off. -when the voltage goes down till 9.5v and more, after 1 min - FULL power off of "power box" (consumption 3.6мА). +5.2v to USB OTG or GND to hall Sensor. OTG or HS choose with jumper on the board. -all output voltage is adjusted with potentiometers. 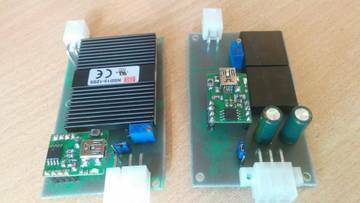 - ESR and EMI filters.